LIX™ Series has it all; every Humminbird innovation from MEGA Imaging™ and AutoChart® Live to Ethernet networking and Bluetooth® connectivity. Now showing on a massive 15″ or 12″ Cross Touch® display-our largest ever. Visit http://www.humminbird.com/Freshwater/Lifestyle/SOLIX_FW/ for more details. Humminbird® Introduces New SOLIX™ Series with Cross Touch and the Industry’s Biggest Screen Size!The revolutionary Humminbird SOLIX Series combines 12″ and 15″ displays with Cross Touch® Interface alongside groundbreaking innovations like MEGA Imaging™, CHIRP Digital Sonar, AUTOCHART® Live with vegetation and bottom hardness mapping, Bluetooth® connectivity and i-Pilot® Link™ navigation. Offering the biggest display in the market – up to 15 inches – the SOLIX boasts technologies designed to make locating and catching fish easier. A truly innovative product, SOLIX delivers game-changing sonar, imaging and mapping capabilities in the largest fishfinder anglers have ever seen. In true Humminbird fashion, these technologies are packaged in an easy-to-use interface and system that can make any angler better. 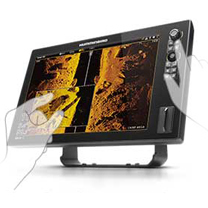 SOLIX is setting the bar for the angling sonar category in display size with two variations – a 12- and 15-inch screen model. Both come standard with Humminbird’s Cross Touch® Interface, letting anglers operate the unit via touchscreen or keypad, all while customizing the screen with up to four independent viewing panes. Cross Touch allows anglers to use the SOLIX either as a touchscreen or with the keypad for easier control in rough water conditions. Individual panes can be zoomed or moved to different screen locations based on angler preference or fishing situation. According to professional bass angler Gerald Swindle, SOLIX gives him a serious advantage over his competition and the fish he’s after. “The size is amazing and allows me to see crucial screen information from anywhere in the boat. Plus, I can set up my panes to simultaneously show me MEGA Side Imaging, MEGA Down Imaging and how I’m oriented to key structure. I get all of that in a glance, so I know that every cast is a productive one,” said Swindle. SOLIX units come in two versions. One is equipped with GPS and CHIRP Digital Sonar, the other adds Humminbird’s game-changing MEGA Imaging. This is the first Down and Side Imaging technology to enter the megahertz range with performance that’s nearly three times greater than traditional 455 kHz frequencies. It results in the clearest, sharpest imaging returns ever. All SOLIX models include CHIRP Digital Sonar, firing more pulses than traditional transducers over a given period of time. More pulses mean more information, improved target separation and superior image clarity at greater depths. Also standard on all SOLIX models is Humminbird’s expanded AUTOCHART® Live technology that creates and saves structure maps on any body of water. AUTOCHART Live identifies and maps depth, bottom hardness and vegetation. Anglers know that fish relate to depth, weed lines and transition points in bottom type – for example where a soft, muddy bottom transitions to firm sand or rock. By collecting all that data on an AUTOCHART Live map, Humminbird helps anglers keep their boat in the strike zone on productive structure. Fishing takes another huge step forward when AUTOCHART Live is used in conjunction with i-Pilot® Link™ from Minn Kota®. With both technologies cooperating, an angler can tell his Minn Kota trolling motor to “follow” a specific AUTCHART Live contour at a set speed, and with the press of a button the boat will precisely follow the exact path. Now, anglers no longer need to guess where fish-holding structure is located. They can precisely follow the weedline, bottom hardness or depth contour, and stay within easy casting distance of their target. Bluetooth is built into every unit, allowing anglers to sync smartphones to the on-board SOLIX. Text messages, missed calls, signal strength and other notifications appear right on the Humminbird display, so phones can stay safely in pockets where they belong for hands-free fishing. It creates a flawless on-board network of electronics and connectivity. 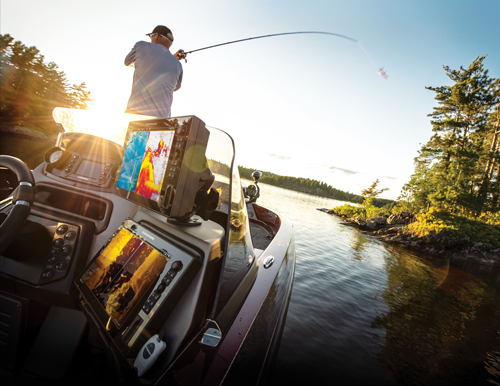 For plug-and-fish networking, high-speed ethernet provides easy connectivity to Humminbird 360 Imaging, Minn Kota i-Pilot Link, Humminbird CHIRP Radar, and additional SOLIX or select HELIX units. The new units are fully compatible with Humminbird LakeMaster® charts, SmartStrike™ and Navionics® Gold/HotMaps™. SOLIX owners can mount their large Cross Touch screens inside the boat dash, on the included gimbal or directly to an optional RAM Mount for multi-directional viewing. Mark Gibson, Humminbird director of R&D, summarized the new Humminbird SOLIX technology by saying “SOLIX is the combination of decades of dedicated development in everything from the transducer to the touchscreen. It’s the best of the best and the most advanced fish locator ever created. Please be sure to go to www.humminbird.com to view the new SOLIX web pages. You are receiving this email because of your relationship with Federation National Office. Please reconfirm your interest in receiving emails from us. If you do not wish to receive any more emails, you can unsubscribe here.